At the age of 67 years old, Wisdom who is a Laysan albatross has set the record as the world’s oldest known breeding bird in the wild. Wisdom lives at the Midway Atoll National Wildlife Refuge, which is on a remote island in the Pacific Ocean near Hawaii. The U.S. Fish and Wildlife Service (USFWS) branded Wisdom back in 1956 and have been keeping track of her ever since. She recently laid an egg at the refuge, which resulted in her extending her record. Staff from the USFWS have been closely monitoring her as she incubates her egg. 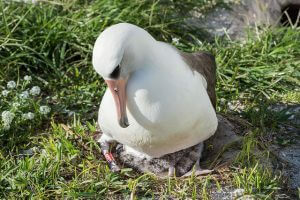 “An albatross egg is important to the overall albatross population” said Bob Peyton who is a USFWS project leader. It’s important that Laysan albatrosses lay multiple eggs throughout their lives because they can only lay one at a time at a rate of one per year. Both parents are responsible for raising the chick with the mother and father taking turns incubating the egg. While one is doing the incubation, the other is out looking for food. This process takes around a month for each rotation. USFWS has estimated that Wisdom has delivered 30 to 35 chicks throughout her lifetime, which is impressive. She has also logged in millions of miles of flying over her 67 years. 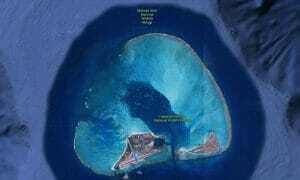 Scientists believe that one of the reasons why Wisdom has managed to live for so long is due to Midway Atoll’s unique environment. The island is essentially predator-free, which has made it home to the largest albatross population in the world. Wisdom has managed to live for 67 years without being harmed by predators, disease, or poaching.